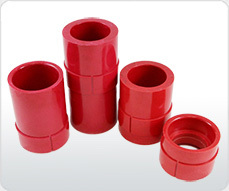 Requiring a component that is both UL listed, and offers high electrical performance such as arc and track resistance, a manufacturer of power supplies contacted Woodland Plastics to utilize our thermoset molding services for their insulation plug components. With four individual components varying in size, but sharing dimensional characteristics, Woodland Plastics molds the insulation plugs in a 4-cavity family mold using a 150-ton thermoset injection molding press. Parts are molded out of BMC 620 Red, a thermoset polyester material, and deflashed before being shipped to a customer plant in Mexico. Product Description This insulation plug is used within a power supply application. Tightest Tolerances Concentricity of Ø.004"